Technically, all literature is art. But for certain subtleties exist. There are (many) instances literature is essentially a factory production, but likewise instances it approaches the more common definition of art—aesthetics, form and style as apparent as plot, character and setting. Capable of being as visually abstract as some of the great paintings, the written word has the added possibility of being able to shift in time—dynamic where many visual arts are static. And there have been many such great works of literature, one perfect (perfect!) 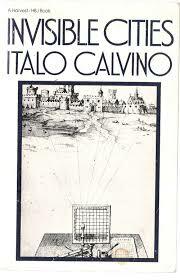 example being Italo Calvino’s Invisible Cities (1982). Like a shifting succession of M.C. Escher lithographs, Invisible Cities builds the imagery of various cities, real and real alike, from various perspectives. The fictional spine joining this skeleton of imagery is Marco Polo, sitting at the feet of Kublai Khan and recounting his journeys through various urban centers spotting the Silk Road. Accurate memory slipping into tall tale and back again, the subjectivity inherent to Polo’s recollections serves to construct and deconstruct the cities through time. The details of architecture and quotidian life in the cities, both real and imaginary, are paraded before the reader’s visual cortex. Always at the core, however, is the transitory nature of both the existence and perception of these elements, existence anything but static. Reading only about ten collections and anthologies (old and new) per year, I’m not the most immersed reader in science fiction and fantasy short stories, and neither am I the most naïve. But when it comes to the current year’s crop, I confess I usually let others do the hard work for me. In this day and age when literally thousands of new stories are published each year, it’s better to let someone whose living is short speculative fiction weed out the fluff. Given this ubiquity, it’s increasingly difficult to pull together a truly comprehensive best-of volume for any given year. 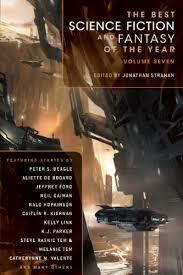 So the least I can say about the seventh volume of editor Jonathan Strahan’s ongoing series The Best Science Fiction & Fantasy of the Year is: it’s done a good job of weeding out the fluff, and the most I can say is: 2012 seems like a pretty good year for short spec fic. Containing thirty-two stories that cover a wide gamut of genre, science fiction to fantasy, horror to slipstream, fairy tale to steampunk, alien encounters to dark satire, space opera to dystopian fiction, and others, Volume 7 attempts to encapsulate just how good 2012 was. Every reader’s own selection would be different, but what Strahan does capture is, overall, worthwhile material that represents the zeitgeist of mainstream speculative fiction. Strahan has his pet authors, for certain, but that they are writing at a relatively high level serves to balance their inclusion. Cyberpunk has its gods. Every genre reader knows the names Gibson, Sterling, and Cadigan. But tinkering in the shadows, and some in plain site though unseen, are a handful of other writers producing highly creative, intelligent material in the medium—or at least somewhere nearby. One such writer who undoubtedly slips under the radar of most readers is Rudy Rucker. 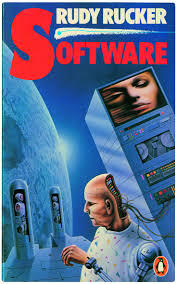 His Ware tetralogy, starting with Software (1982), is the perfect example of non-mainstream cyberpunk possessing a creativity and intelligence worth the while. And it’s just damn funny—obliquely so, but for the proper audience it’s more than a proper book. Dr. Cobb Anderson, the man who set robot sentience free, finds himself in old age and in need of a new heart. A robotic doppelganger offering salvation, Anderson receives the offer of a lifetime (literally): to go to the moon and there have his mind transferred into a mechanical body—immortality in digital form at the expense of his mortal coil. Meanwhile, drug addict and burnout Sta-Hi Mooney the 1st (born Stanley Moonley Jr.) likewise finds himself in an unenviable position: in the hands of brain eating serial killers. Escaping to the moon, he finds himself surprisingly in the company of Anderson. The lunar colony heavily populated by robots, slowly Anderson’s goal and the fate Mooney sought to escape, collide. This is essentially an extension of my review of Alter Reiss' Sunset Mantle. Not entirely review material, however, more commentary, I decided to post it separately. It’s possible the reader can end their reading of my review of Alter Reiss' 2015 Sunset Mantle, here: the novella is as formulaic as epic fantasy/grimdark can possibly be. Even Johnny knows the score. And there is nothing else to compliment—no rich prose, no subversive elements, no lush setting, no plot twists, no... Told in rudimentary fashion, an idyllized man (brute strength, honor, intelligence, blah, blah, blah) takes revenge on those who tried to cheat him, and, of course, gets the woman and a seat of power. The end. Those interested in further commentary may continue. Fairy godmother Desiderata Hollow has passed away, leaving one unfinished task to her successor Magrat Garlick: go to the city of Genua and prevent a girl from marrying a prince. Oh, and she also leaves strict instructions that Nanny Ogg and Granny Weatherwax are not to be traveling companions on the trip, nor ever to touch the fairy godmother’s wand. In a tussle of skirts and vests, boots and broomsticks, the three—Magrat, Nanny, and Granny (would it be any other way)—set out on the journey. Throughout the stages of their trip, strange reflections appear in mirrors around the women. Someone meddling in the affairs of the peripatetic trio, it’s a good thing Nanny Ogg also brought her tomcat Greebo along for the trip. His brawn is needed when marriage time approaches. 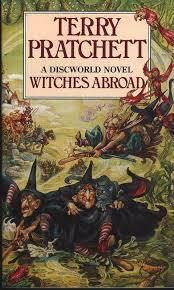 Traveling through the Discworld equivalents of France, Spain, New Orleans, and beyond, Pratchett has a riot riffing off European and American culture. Like your grandmother’s first trip outside her comfortable little village, the three elderly ladies find themselves at a loss for language, cosmopolitan panache, and knowledge of local cultures every step of the way. Eating strange foods, drinking exotic alcohols, and running with the bulls, they never find themselves lacking in the confidence needed to keep pushing ahead, however. Plowing into every new situation with humorous innocence, Pratchett takes advantage of mispronounced foreign words, cultural taboos, and and an overall blind perseverance to get his trio into Genua in time for the proposed wedding. 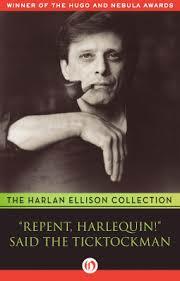 For anyone with a passing knowledge of speculative fiction’s history, there is an awareness that Harlan Ellison, love or hate the man’s personality, is a writer to be experienced not summarized. You may encounter this review and get a perspective on the fiction, but encountering it first-hand is an entirely different bucket of frogs. When he's on, he's on—a prose master that grabs a thread of story and runs headlong with it, the narrative voice undeniable. (And when he’s not on…) So, forget what Ellison says off-screen and just read his stories. 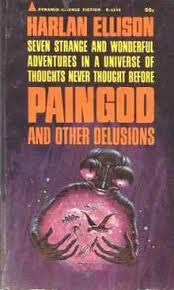 There are none like them, anywhere, and his 1965 collection Paingod and Other Delusions is a prime example. The collection opens on the title story “Paingod.” A tale of the god Trente, deliverer of pain to the huddling masses ("the one who dealt out the tears and the anguish and the soul-wrenching terrors that blighted life from its first moment to its last"), changes are afoot in the heavens when he begins to have a sense of empathy. Looking down upon two particular men, their stories feed into his beliefs, and ultimately inform his final stance on the subject of suffering. Myth twisted, this story is not what the reader might expect given the opening. More suffering, this time indirectly at the hands of a particularly regimented government, “’Repent, Harlequin!’ Said the Ticktockman,” may be the most representative Ellison story in the collection. Telling of a non-conformist and his experiences at the hands of an extreme-rote ruling body, the man’s ultimate fate in the system falls somewhere between Nineteen Eighty-four and A Clockwork Orange. 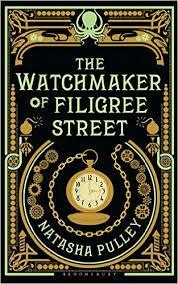 Short Review: Nick Harkaway’s Angelmaker is the same type of story but notably better from nearly every perspective. Why read Pulley’s novel? What is it these days with stories that are obviously YA (i.e. juvenile content) marketed as adult fiction? “The Drowning Eyes” by Emily Foster (2016) is the story of Shina. Lone survivor of a pirate attack that killed her fellow weather-workers (called Windspeakers), she sets out on a quest to recover a magical item stolen from their school. Catching a ride on a north-bound ship, the journey proves as fun as it is dangerous with the raucous crew. Sea waters tempestuous and pirates bloodthirsty, Shina goes through hell and back again developing her nascent weather controlling powers to save the Windpseakers from oblivion. 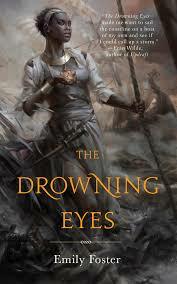 While SJWs are sure to rave for the surface elements, if it isn’t obvious from the plot introduction, “The Drowning Eyes” remains a trite piece of contemporary, substance-less fantasy. Foster checks most boxes for political correctness (Feminist elements? Matriarchal society: check. 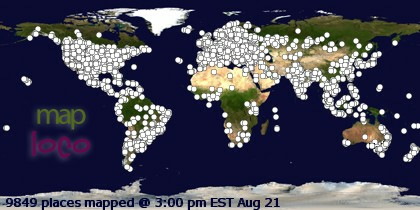 Racial diversity? People with non-white skin: check. LGBT___ elements? Lesbian captain: check.). But unfortunately, it also checks a lot of the boxes laid out in the guidebook for writing low-grade mainstream fiction. High school level dialogue? Check. Formulaic plot? Check. Likeable (i.e. non-realistic) characters? Check. Serviceable (at best) prose? Check. Faceless evil? Check… This is a round about way of saying, no matter how progressive several of the story elements are, the whole cannot be said to be an examination, or even commentary on, contemporary socio-political issues. The name of Shina’s ship the Giggling Goat, the novella is light entertainment—at best. The annual Burning Man gathering in the deserts of Nevada is by turns surreal and decadent. Artistic expression prized most, the concepts and presentations which result belie extravagance and dynamic creativity. Massive sculptures, mutant vehicles, pyrotechnics, electronic music—its for hippies and connoisseurs alike. Though more staid (i.e. European) and fantastical (i.e. science fictional), J.G. 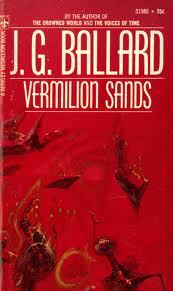 Ballard’s 1971 collection Vermilion Sands nevertheless takes a similar variety of perspectives to art in a desert community setting. Ballard likewise dynamically creative, I assume Burning Man is green with envy at the possibilities of his fictional scene. Catering to a mosaic of people in the languid heat of the desert, Vermilion Sands is a resort town where tourists and poets, merchants and artists, actresses and retirees live in indolent leisure, clashes evolving on occasion from their circumstances and personality issues. Catalyzing the collection is the variety of arts individual to each of the stories. Sonic sculptures, cloud carving, photosensitive paint, emotionally-retentive domiciles, singing plants, living cloth, poetry machines—Ballard uses the possibilities of science fiction to describe fantastical scenes wherein art and humanity intersect in surreal fashion. In the introduction to her collection of poems and essays Dancing at the Devil’s Party, Alicia Ostriker writes that any good artist’s m.o. is defiance of norms. (I paraphrase.) There may be no writer who takes this idea to heart like Harlan Ellison. His personality controversial enough, he walks the talk in his fiction, however, of which his 1965 novelette “’Repent, Harlequin!" Said the Ticktockman” is a prime example. Non-conformity in absurdist terms, Open Road Media’s re-release* of the story in 2016 provides a strong representation of Ostriker’s view. Prefaced by the (loosely styled) essay “Stealing Tomorrow,” Ellison describes mankind's primitivism in the face of civilization, and the instinctual desire to rebel against that which is rational. The essay setting the tone, “’Repent, Harlequin!’ Said the Ticktockman” goes on to tell the story of a non-conformist flouting the legal and social mores of a society governed by the clock. A satirical representation of the freak scene happening in American counter-culture of the 60s, the conclusion forms a Nineteen Eighty-four body with A Clockwork Orange head. For a lot of people, Lauren Beukes’ second novel Zoo City put her name on the genre map. Nominated for and winning awards, her semi-cyberpunk Johannesburg with animal familiars was a success. The actual quality of the novel a touch more equivocal, it was certain, however, latent talents were bursting to be developed. The follow up novel, 2013’s The Shining Girls, reveals the next step. 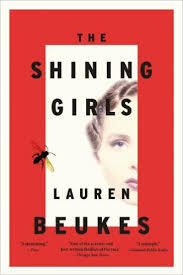 A very dark, very visceral, very brutal story, The Shining Girls is about a time-traveling serial killer focusing on women. Locked up in that sentence is the potential for cheese—and from some aspects the novel doesn’t escape a little stink. But it does in others, Beukes’ talents stepping up to provide substance worth the time. Ignoring the shimmy-shammy of explaining time travel to cut to the heart of her schema, Beukes tells the victim’s stories, and how their arcs through life are cut unnecessarily short by one deranged man. The Ophiuchi Hotline will be precisely what many readers of science fiction desire and perhaps expect: a dynamic tour of ideas. Shooting around the solar system and beyond, mysterious aliens have wiped civilization from the Earth, and what they’ve allowed to remain survives on tech doled out via the eponymous channel. Humanity divided into two camps: those who prefer the new state of humanity and those seeking revenge, the clones of one women, all named Lilo, find themselves in the thick of the factions, trying to make sense of reality getting to the bottom of who precisely the Invaders are, and their plans for humanity. 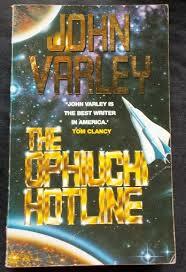 Post-human before it was a thing, The Ophiuchi Hotline must certainly be considered proto-cyberpunk. There are aliens and space travel which limit the full taxonomy, but highly+advanced plastic surgery, genderless humans, free sexuality, cybertech, dubious techno-commercial interests—all combine to give the novel something of the flavor of Schismatrix meets Neuromancer, even as the alien takeover wrangles the plot. Futurology (not to be confused with Futurism) is certainly an aspect of modern/post-modern “civilization.” More rationale than mysticism, it predicts the future from science rather than the yarrow sticks and tea dregs. And yet there remain similarities. Vernor Vinge’s Singularity proclamations have given rise to futuristic visions wherein the line between magic and science is obliterated. And in the metamodern world, the practice continues—science thisclose to providing a utopia for many. In the context of growing populations, environmental issues, social unrest, changing job markets, rapid technological growth, and a variety of other issues, the human psyche has created a variety of expectations for this science—how to correct, how to mititgate, how to escape, how to exist in what remains of the 21st century and beyond? 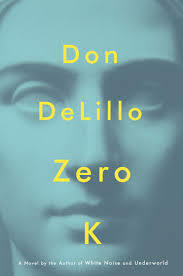 Capturing the equivocalness inherent to thoughts on mortality/immortality which result, Don Delillo’s 2016 Zero K is as tangible as it is futuristic. Where Vinge’s Singularity has seen science pushed toward fantasy, Zero K pushes science toward religion. (Similar, but not exactly the same.) 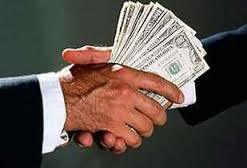 Jeffrey Lockhart is the son of a multi-millionaire. His father has invested huge amounts of money in a remotely located cryogenics/nanotech facility called Convergence where the world’s rich can go to have themselves preserved should technology ever advance to the point to revive them. Visiting his father at the facility to see his stepmother “inducted,” Jeffery comes face to face with the cult nature of Convergence—science spun into faith until it’s too difficult to see the difference. Having trouble coming to terms with his own affected existence dealing with the reality of his step-mother and father’s choices, his experience at the facility culminates in a worldview he never saw coming. King Arthur stories and contemporary fantasy seem a match made in heaven. Medieval setting? Check. Knights and kings fighting for honor and power? Check. Wizards and sorceresses? Check. Epic wars on epic battlegrounds? Check. Indeed, whether it knows it or not, much of contemporary epic fantasy owes its existence to Uther Pendragon’s son. But science fiction? The match less apparent—and one that is certainly limited to success under certain, ahem, space opera conditions, science fiction has nevertheless been married to Arthurian legend on a few occasions. Poul Anderson sending knights comically swishing through space in The High Crusade (he would later make up for this goof with “The Saturn Game”) and C.J. Cherryh attempting an Arthurian novel with a bit more ambition in Port Eternity, there are examples of the two being squeezed together. 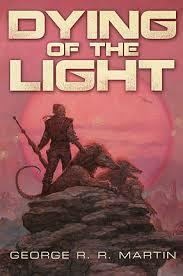 George R. R. Martin’s Dying of the Light (1977) is certainly another. Neil Williamson’s name is not one that rolls readily off the tongue of most readers of science fiction and fantasy. Though regularly published for more than twenty years, the few dozen shorts, novel, and collection have not been enough to bring the author to wider recognition—even if the novel, The Moon King, was nominated for a BSFA. 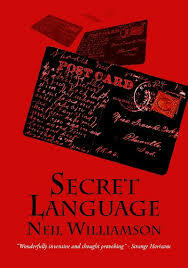 Predominantly published outside most mainstream genre magazines, 2016 marks the release of his second collection, Secret Language (NewCon Press)—and high time the genre paid a little more attention. Retro science fiction is something of a trend in today’s genre scene. Perhaps only minor, a swell of stories hearkening back to days of old is visible nonetheless. Contemporary authors are going in a few directions with it: imitation, homage, subversion, and otherwise. 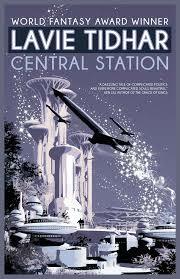 Lavie Tidhar’s Central Station (2016, Tachyon) is part of the swell (look at the gorgeous cover), but given its mode, takes its own slant. Central Station is a spaceport story—a milieu of not only people and characters, but science fiction and science fiction tropes, all centered around Tel-Aviv’s central transport hub many years in the future. Paean to genre, it likewise attempts to relate aspects of humanity which appreciate things like science fiction, or, more broadly, get upset at runaway family members, dream of being something more, fall accidentally in love, and ultimately try to live this thing called life. A shop owner, a bookseller, a junk collector, a manual laborer, a doctor, a migrant, an artist—these are the basic building blocks of character, even as a universe of space ships and technology flow around them. Episodic in nature, characters that were once the focus of an episode, later re-appear to support and enhance the current focus, the picture of the spaceport built in the interstices of their stories. Like good artists, there are also good writers who choose a concept and explore its reaches in a series of works. For J.G. 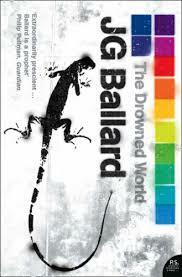 Ballard, the start of his career saw a succession of catastrophe novels that all delved into the human psyche facing realities disturbed by vast environmental changes. Sticking to the natural realm, the second of these novels, The Drowned World (1962), posits the Earth inundated with water in the wake of greenhouse changes. Temperatures soaring near the equator, The Drowned World features a humanity pushed further and further toward the poles in escape as rising ocean waters engulf coastal inlands. London buried beneath mega-tons of water, all that remains is an archipelago of hotels, skyscrapers, and other buildings, human life is limited to the upper floors, boats, and scavenging among the remains for food, water, and fuel. The thermometer hitting more than 120F/49C in the full heat of afternoon, the effects of solar radiation have combined to evolve flora and fauna—giant mosquitoes and mutant vines, the city nothing like we know it today.